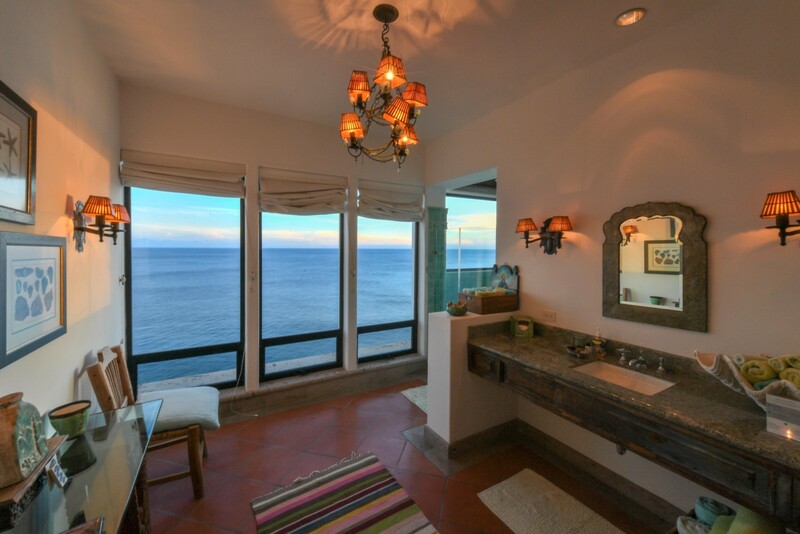 One of Pedregal’s newest and brightest stars is the magnificent Villa Turquesa, on a cliff overlooking the Pacific, 350’ directly above the beach. This option has 10,000 square feet of elegant indoor space, and another 10,000 square feet of complete privacy and spectacular outdoor amenities. Its graceful, flowing architecture reveals expansive living areas, luxurious furnishings, and exceptional amenities throughout. Feel the cool Saltillo tile underfoot as you stroll through this spacious estate. Enjoy an early outdoor breakfast and then a little private practice on your own putting green. Hold a rousing shuffleboard competition after lunch. Schedule a late-night movie marathon on the 42" plasma TV. End your day with a steam bath in the master suite. No matter where you are at Villa Turquesa, there is room for everyone. The main terrace includes a lap pool with swim-up bar, shade structures, lounge chairs, and outdoor dining space for up to 60 guests. Enjoy gorgeous blue-water views, fresh breezes and stunning skies from every vantage point. A great deal of thought has been given to creating fun and relaxation for every guest at Villa Turquesa. This truly is the ultimate choice for a private, luxury villa vacation in Cabo! OPTION: This villa has a lower level which can be added to make a 9BR/11BA rental. The additional floor contains 5 bedrooms, shuffleboard court, putting green, children’s play area and a large home theater (media room) with surround-sound system, 10 reclining leather chairs, and additional seating for up to 12. Total square footage with this option is 15,000 sq ft of indoor space. Maximum permitted occupancy is 20 adults plus 8 children. • Chef Lorenzo can provide cooking services for breakfast, lunch and dinner. Rates to be paid direct plus the cost of food. Arrangements to be made prior to travel. Gratuity additional and recommended.